Ouyang Yujing, China's director-general of the Department of Boundary and Ocean Affairs of the Ministry of Foreign Affairs, speaks at a briefing on China's stance on the South China Sea, in Beijing, China, May 6, 2016. As China awaits an international arbitration ruling over its claims to almost all of the South China Sea, Beijing issued a warning Friday to its critics, stating that the more they challenge its position regarding disputed territories in one of the world’s busiest waterways, the more it will push back. Speaking at a special briefing on the dispute, Ouyang Yujing, director-general of the Chinese Foreign Ministry's Department of Boundary and Ocean Affairs, said China is willing to take into consideration constructive comments and criticism from relevant countries. "But if they are aimed at putting pressure on China or blackening its name, then you can view it like a spring, which has an applied force and a counterforce. The more the pressure, the greater the reaction," he said. 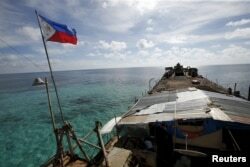 Each year, more than $5 trillion in maritime trade passes through the South China Sea’s energy-rich waters. China claims almost all of the sea to be historically part of its territory and in recent years has been aggressively creating artificial islands there to bolster its position, including the building of airstrips. But the waterway is also crisscrossed by claims from the Philippines, Brunei, Vietnam, Malaysia and Taiwan. Beijing has long insisted that the disputes be handled through bilateral negotiations between claimants and argued against any international involvement, but its actions have been an increasing source of tension in the region and beyond. China has said the disputes are being exaggerated. At the same time, it has been stepping up its rhetoric ahead of an international ruling on its claims in a case that the Philippines lodged against Beijing in the Permanent Court of Arbitration in the Hague. The ruling is expected in the coming weeks and is likely to favor the Philippines. 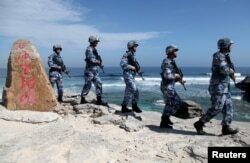 Soldiers of China's People's Liberation Army (PLA) Navy patrol at Woody Island, in the Paracel Archipelago, which is known in China as the Xisha Islands, Jan. 29, 2016. Ouyang said that since the case is about sovereignty and maritime delineation, the court has no right to hear the case. Ouyang went on to state that from China’s point of view, the Philippines has been "illegally occupying" Chinese islands from the 1960s. Bonnie Glaser, senior adviser for Asia at the Washington-based Center for Strategic and International Studies, said she expects China to reject the ruling. “It is also stepping up efforts to prepare the public by justifying China's position. At the same time, the Chinese foreign ministry is lobbying countries to support its position and seeking to expand the numbers that are on its side,” she said. China, which has emerged as one of the world’s biggest investors, is offering a combination of incentives and threats to enlist the support of different countries, analysts said. Beijing wants to avoid a loss of face because the U.N. tribunal is expected to support Manila's claims on the disputed islands. It is also concerned that other claimants may follow in the Philippines footsteps. But analysts are divided over whether China, with its massive economic clout, would be able to force at least some western countries to change their stance and back it in opposing the Philippine’s case. The U.S., which has criticized Chinese construction and creation of artificial islands in the South China Sea, is perceived to be backing Manila. "I think the U.K., Australia, and other Western countries are willing to stand firm on their principles on this matter. I am doubtful they will back China or even remain silent," Glaser said, adding that "China needs the U.K., Australia and other nations just as much as they need China." And while China has hoped that the Philippines would drop the case, it is unlikely that the situation there will change much as well. The Philippines holds presidential elections on Monday and most of the candidates in the polls have taken a staunch view against China. "This means, the Sino-Philippine relations won't see quick and substantive changes even after the new president is sworn in, whoever he or she is,” said Ju Hailong, a research fellow at the Collaborative Innovation Center for South China Sea Studies.